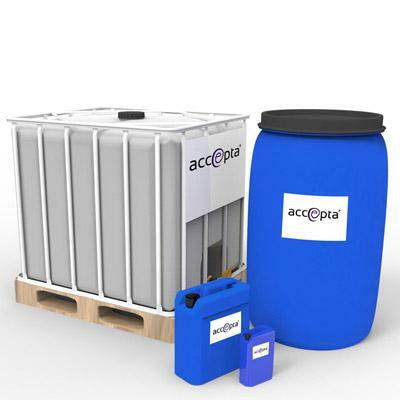 Accepta 2973 is a high performance; liquid boiler treatment scientifically formulated using nickel catalysed sodium bisulphite and developed as an oxygen scavenger for the treatment of steam boilers and boiler water systems. Accepta 2973 is a non-volatile, inorganic oxygen scavenger, which can be used in systems operating at pressures up to 65 barg. It contains 23% sodium bisulphite. Accepta 2973 begins to break down at pressures of 43 barg and is completely decomposed at pressures above 65 barg. Accepta 2973 prevents corrosion in boiler and other water systems by reacting with any dissolved oxygen in the water. Accepta 2973 may also be used for the removal of chlorine. Accepta 2973 must be fed neat. Accepta 2973 must be fed continuously to the storage section of the deaerator below the water line via a stainless steel quill. Accepta 2973 cannot be fed prior to the attemperation water take-off point. Accepta 2973 cannot be mixed with other chemicals either neat or in diluted form. Accepta 2973 is compatible with most of Accepta’s other internal boiler treatment programmes.